All 15 checkers start off the board. One die is tossed by each player to see who rolls first and the player with the higher number then tosses both dice to start the game. White moves his checkers counter clockwise in the diagram above, towards his home board on the lower right while Red moves in the opposite direction or clockwise to his home board on the upper right. A player enters his checkers onto the board corresponding to the exact numbers he rolls on the dice. Once a player has checkers on the board he may begin to move them around the board or use his dice rolls to put more of the 15 checkers on the board. Obviously you want to get all your checkers in as soon as possible so that your opponent does not come around quickly, and make points in his own home board that will block out and hamper your remaining checkers from getting into the game. You should at least get some in and start a blockade and keep points in your opponent’s home board that can be used as landing spots for the rest of the checkers not in yet. – Two or more checkers on a point blocks the point.- A lonely checker (blot) can be hit and sent back to be re-entered .- You play your dice rolls as separate numbers and if either only one or the other number is playable you must play the higher number.- If you roll a double such as 4-4 you play the number four times.- All checkers must enter the home board, before a player may begin to bear them off. However, there are two elements in this game that are different than regular backgammon . One is used during the bear off stage and the other is a special feature when you roll a 1-2. The Bear Off: You may only bear off checkers using the exact numbers rolled on the dice. If for example you roll a 4-2 you may only remove a checker from your 4 point and another from your 2 point. If you do not have any fours or twos remaining, you cannot use the 4-2 to take off a 6 nor can you move checkers from higher points to lower points using the 4-2. The Roll of 1-2: If you roll 1-2 and can move both the 1 and the 2, you then choose to play any double you desire without rolling the dice: example 6-6. You then play your four sixes and get to roll and play again. If you roll a 1-2 again, you play the 1 and 2 and again get to choose any doubles you wish, and so forth. However, remember that in order to choose a double you must be able to play the 1-2, meaning that if either or both ones and twos are blocked, you make the move you can, but your turn ends there. Similarly, if you choose a double like 6-6 and can only move three of the four sixes, your turn also ends there, and you do not get the chance to roll another 1-2. Although the roll of 1-2 significantly increases the luck element in the backgammon game there is still a lot of skill required as many backgames will be played when you have 15 checkers back. Backgammon … Glück oder Wahrscheinlichkeit! The American version of Acey-Deucey has been a favorite game of the U.S. Navy, Marine Corps, and Merchant Marine since the First World War. Each player starts with fifteen checkers off the board. The players enter their checkers in the opponent’s home board, then bring them around the board as shown in the diagram below. The object of the game is to move all of your checkers around the board to your own home table and then bear them off. The first player to bear off all of his checkers wins the game. Each player rolls one die and the higher number goes first. That player then rolls both dice again to begin his first turn. You enter a checker by placing it on a point in the opponent’s home board corresponding to a number rolled. For example, if you roll 6-3, then you enter one checker on the opponent’s six-point and one checker on his three-point. Once you have entered one or more checkers, you may use subsequent rolls to move those checkers forward, to enter more checkers, or both. First you play the 1 and 2 in the normal way. Then you name any roll of doubles you wish and play it accordingly. Then you roll again and play the roll as usual. If the number rolled is another 1-2, you keep goingnaming and playing a double of your choice, and then rolling again. Note, however, if you are unable to use any part of your roll, you forfeit the rest of your turn. For example, if you can move your 2 but cannot use the 1, you may not name a double and you may not roll again. It is permissible to name a double even if only part of it can be used. For example, after moving 1 and 2, you can name 6-6 as your double even if only three of the 6s can be played. You would then lose the fourth 6, and you wouldn’t get to roll again. A checker sitting alone on a point is called a blot. If an opposing checker lands on a blot, the blot is hit and placed on the bar. Any time you have one or more checkers on the bar, your first obligation is to reenter those checker(s) into the opponent’s home board. You reenter a checker by moving it to an open point corresponding to one of the numbers on the rolled dice. If you are able to enter some but not all of your checkers on the bar, you must enter as many as you can then give up the remainder of your turn. Once you have moved all fifteen of your checkers into your home board, you may begin bearing off. You bear off a checker by rolling a number that corresponds to the point on which it resides, then removing the checker from the board. The loser pays one point for each of his checkers still on the board (or yet to be entered). Gammons and backgammons do not count extra. The doubling cube is not used in acey-deucey. 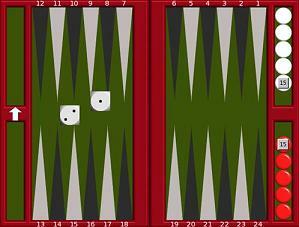 Because the roll of 1-2 is so powerful, luck plays a greater part in acey-deucey than in regular backgammon. You are never completely out of a game. On the other hand, since you start with fifteen men back, there is some added opportunity for skill in placing your checkers to block the opponent. Typical strategy is to get at least half your checkers on the board as quickly as possible and form them into a blockade. All checkers start off the board. After rolling 1-2, the player gets to name and play a double of his choice and then roll again. The winner scores one point for each opposing checker not borne off. Oswald Jacoby and John R. Crawford: The Backgammon Book (page 211). Walter Gibson: Fell’s Guide to Winning Backgammon (page 151). John David Galt: Posted to rec.games.backgammon .